Accell has been my go-to company for almost a decade now when it comes to adapters and specialty cables. Before I began reviewing products for them I was already a customer. They make some of the highest quality adapters and cables, and not one has failed me yet. Expanding upon adapters, cables, and hubs, the new Accell Thunderbolt 3 Docking Station is no different. It wreaks of quality. The packaging alone suggests how much attention to detail Accell paid to this particular product. 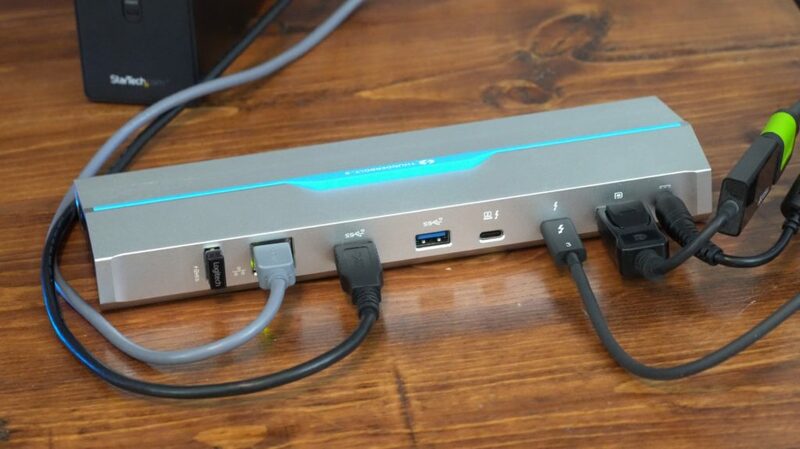 The dock has a lot of ports, all with the latest connectivity options. 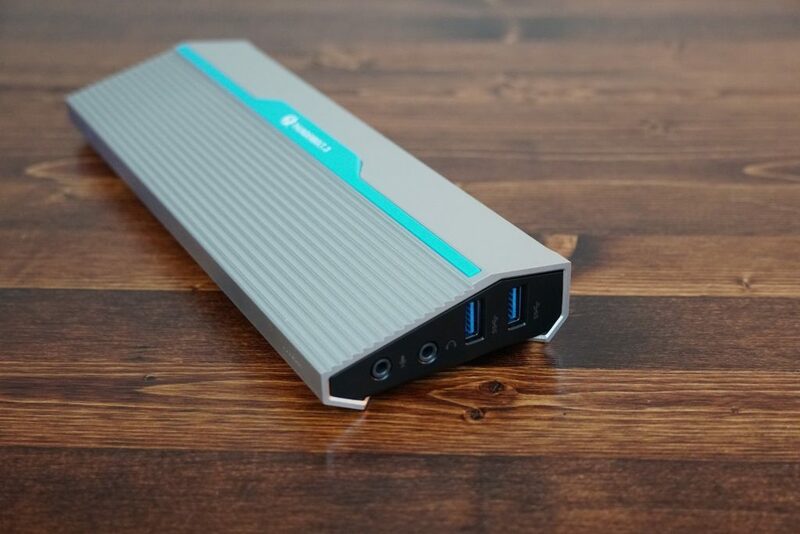 It includes a 130 watt power supply, which can provide up to 70w charging capacity to a laptop via the upstream T3 (Thunderbolt 3) port. The downstream port provides up to 15w of charging capacity. The dock also includes 5 USB A ports, three being USB 3.0, two are USB 3.1 (10 Gbps). The Ethernet port supports 1 Gbps, and there are analog headphone and microphone jacks. Lastly, a full size DisplayPort supports multiple monitors with compatible adapters. I tested this product in many ways. My goal was to use it for a long period of time, beyond a simple functionality check. The product is wrapped in aluminum which doubles as a good aesthetic while also being a functional passive heat sink. Because of this, it does not need active cooling (a fan). The product get’s a little warm but nothing uncomfortable to touch. I’d say the aluminum is doing its job. The Ethernet port functioned as expected once I accepted the initial driver installation for the dock. No surprises there. Although I do not have a multi-drive Thunderbolt SSD dock (one day), I did run multiple USB 3.0 SSD benchmarks through the dock. It performed identically to being connected locally, which suggests no performance loss when using the docking station for large data transfers. Everything else, of course, worked as it should. I didn’t have any static when using the analog audio ports. Peripherals were working with ease. The USB ports had enough juice to spin up two 2TB mechanical hard drives (some USB ports just aren’t strong enough for one). Thanks to an Accell DisplayPort to HDMI 2.0 adapter, I was running 4k with no issues on an HDTV. Even with the docking station and adapter, I still confirmed HDCP to work properly. HDCP allows you to watch DRM protected content like Netflix on a PC. Some cheap docks or adapters are not HDCP compliant so you would lose this functionality. That wasn’t the case here. Another important note is processing graphics rich content on external monitors. It’s a lot of information to process, and most external docks tend to struggle with keeping up. Moving a 4k YouTube video or large picture around the screen on an external monitor will bring some external graphics cards, docks, or hubs to its knees. You often experience choppiness or stutters when dragging things around which creates an unpleasant and distracting user experience. This is a big no-no for content creators which do this frequently. This particular docking station showed no signs of such issues, performing exactly like my built in 4k display on my laptop. There’s a pro and con to reviewing a product like this. The pro is that it’s easy to cover something that meets or exceeds all expectations. I didn’t have to troubleshoot anything or dig deeper into any inconsistent issues. It just worked. The cons? Reviewing something that works this well might come across as stale. There isn’t much more to discuss because it performs as advertised. I think this is a wonderfully-built product that is 100% capable of professional/workstation usage. Accell continues to make excellent products, and the Accell Thunderbolt 3 Docking Station manages to raise the bar even higher. This dock will work with Intel-based Thunderbolt 3 compatible laptops and workstations. I tested this dock on a Dell Precision 7210 workstation and had no issues. Modern Macbooks and comparable laptops should have the same experience.